Get the lowdown on the soothing hue. As we find ourselves on the brink of yet another new season, the time has come where industry leaders and influencers unveil their forthcoming collections, each one geared towards ushering us into a year of fresh styles and design. While furnishings and decorative accents definitely hold their own, one can’t overlook the importance of color, namely one that relates to paint. Inspiring our interiors with an encouraging refresh, said colors set the decorative tone for designers and design-lovers alike, regardless of where or how they are used. Enter Behr: The paint brand just announced their 2019 color of the year—and it’s a good one. The aptly-titled hue is known as “Blueprint” and it embodies the soothing properties of the ever-so-popular base hue, beautifully mixed with soft gray undertones, resulting in an all-too-appropriate and seasonal finish. According to the paint brand, the color is one they describe as “an honest, approachable color,” characteristics we can definitely get behind. 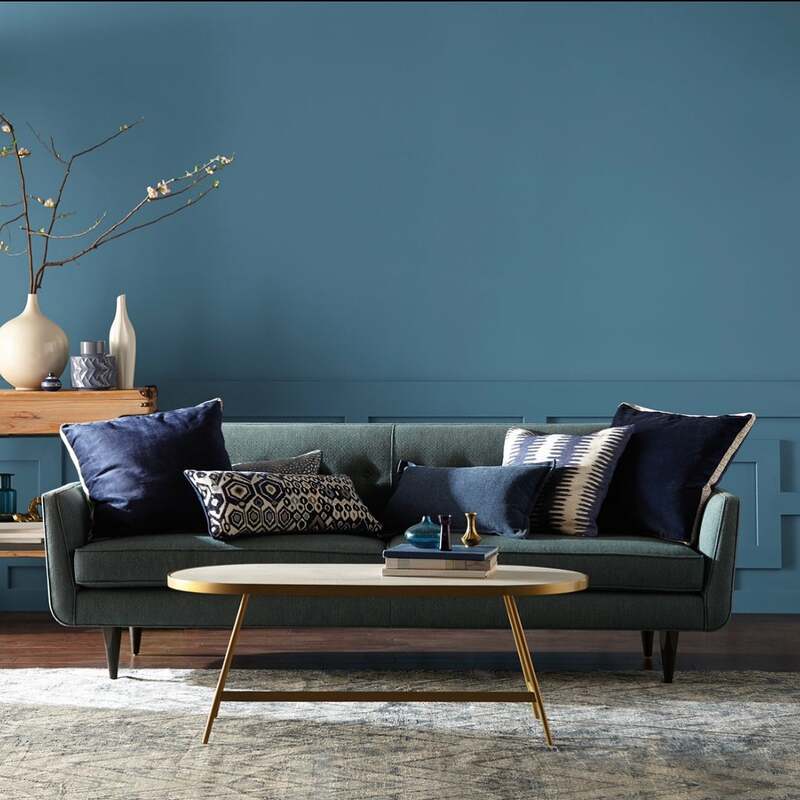 Interestingly enough, the hue bears a striking resemblance to Behr’s 2018 Color of the Year, “In the Moment,” proving the timeless qualities of the shades belonging to the tonal family. As blues are commonly known for their calming effect, the need for such comes as no surprise. Versatile in nature—be it Blueprint or In the Moment—the shades all have the unique ability to bring on an elevated element to the space they embody. Now, the part we’re most looking forward to with Blueprint? The alluring hue can be coupled with an extensive array of colors, ranging from the vibrantly saturated to the moody and muted. Come fall and winter, we’re all for a color block that results in a subtle contrast—think Blueprint paired with a soft sage green or muted gray. You may just as easily brighten up the color by opting for decorative furnishings that fall on the warmer end of the color spectrum. And as always, when it comes to the colder months, it’s all about the textures—and this serene shade of blue is begging to be layered with cozy materials in elevated neutrals. The unveiling, which took place at the Behr pop-up paint shop in NYC’s Soho, also featured the reveal of a handful additional shades and palette pairings, which you can expect to see more of in the coming year. The hue is available for purchase exclusively through Home Depot.